A must have list if you plan to explore the haleem scene in the city. Ramzan is a special time in Hyderabad, especially if you are fond of Hyderabadi food. Haleem’s seasonality also makes it a much-sought-after delicacy. 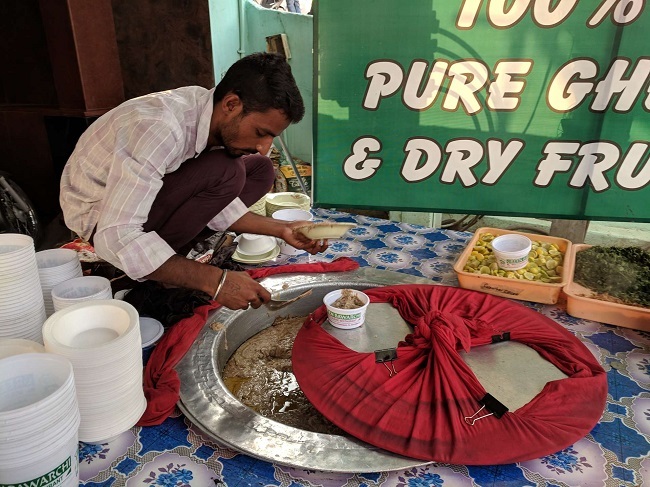 Though there are a couple of places that serve haleem all year round, during the holy month of Ramzan, every Hyderabadi restaurant worth its salt makes and serves haleem. In many of these places, special haleem ustaads are engaged, special cooking stoves erected, special equipment procured and the special dish cooked. Making haleem is a time-consuming affair – the cooking starts early in the morning by 5 am, and is concluded in the afternoon at about 1 or 2 pm. 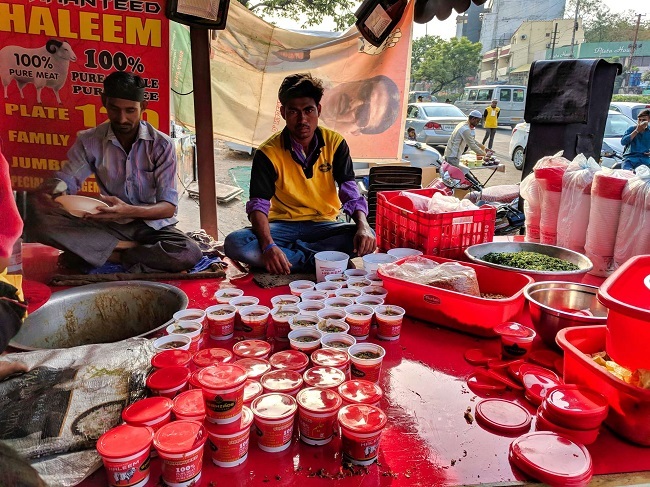 Every year, it becomes a bit of a race to see how many different haleems one can have, and what different types of haleem one can find. Here is a bunch of places I’ve eaten haleem at this year - there are a few big names missing, but a lot has been written about them already! 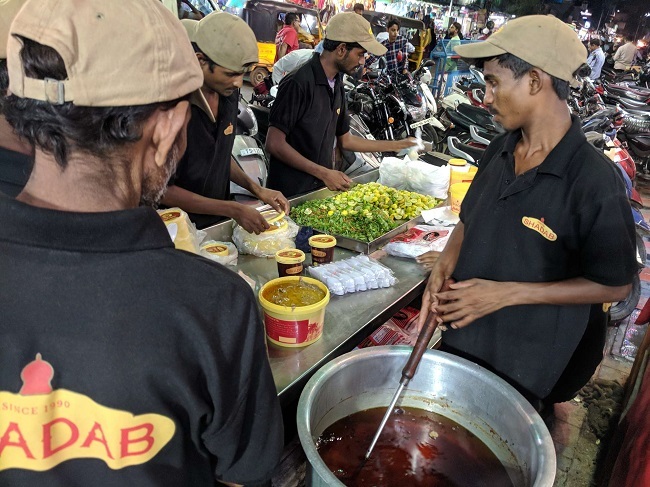 Hotel Nayaab is one of the Old City’s famous eateries - their paya masala and kesar chai bring people from all over to the crowded lanes of Charminar. Their haleem is no different - it stands head and shoulders above any haleem you can get within walking distance from there. A beautifully balanced, finely-mashed affair, it also has more than its share of the soup, making it quite rich. What stands out is the flavour that bursts through in every bite. It is also a heavy haleem, and is one that can definitely be split three ways. Verdict: A must-have haleem. Wherever you are, it’s worth traveling the distance to Nayaab. This was a brand spanking new operation, and a giant screen outside proclaimed it was under new management. As with any new operation, there were more than a few hiccups and the dining experience left a lot to be desired. The haleem, however, took it to a whole new level of nope. It was rough, and tasted like they put too much of the husk in it - with a bitter aftertaste. Even if you ignored the bitterness, the taste of the masala was bland, and there was no flavor that was readily discernible. This made the bitterness the defining taste. Perhaps the first haleem where I left behind more than I ate. Verdict: Nope. Go to Shadab and have a faluda instead. For me, Shadab is the grand dame of biryani in Hyderabad, and their extensive menu is nothing to shake a fork at. Tasty Hyderabadi food in a typically Hyderabadi setting, a no-frills experience made special with the hospitality of the staff - that’s what Shadab means. So naturally, when everyone serves haleem, so does Shadab. I found myself eating haleem with two random strangers, and we all agreed that this was not the best haleem we had tasted. There was nothing wrong with it - it was tasty, well-balanced and tender. Yet it was rough and had more than a fair share of bones. It was an adequate haleem, but it left a heavy feeling in the stomach. It looks like the ustaad who makes the biryani has nothing to do with the haleem. A haleem-only, delivery-only service we found on Swiggy. Needless to say, our curiosity was aroused and we had to try it out. It was quite delicious - nicely mashed and well-balanced. Perfectly good when you don’t want to go out in search of haleem and Swiggy is your saviour. Verdict: A perfectly serviceable haleem if you want it delivered at home. MRCB is one of those curious restaurants which is a self professed jack-of-all-trades - their name stands for masalas, rotis, curries and biryanis. With such a wide repertoire in their name, I just had to try their haleem, especially when I saw that it was made in their own bhatti. I must admit I was not too hopeful - I was doing it to tick a box rather than to taste their haleem. However, I was pleasantly surprised. The haleem was actually good. A bit on the spicier side, it was nicely balanced. Finely mashed and tasty, hearty haleem - I polished off my share without a pause! Verdict: One of the better haleems in the area. If you’re there and want haleem, go for it. The well-known Bawarchi Hotel has spawned many namesakes, and the Green Bawarchi is one of them. I wanted to try the haleem at one of these places to see if it was any good. My interest was also piqued since they had their own bhatti (haleem-making setup with a temporary stove and a giant cauldron, not unlike Getafix’s in the Asterix comics!). The haleem was quite coarse, like they just stopped at one point because they had had enough of the pounding, and not because their ustaad figured the haleem was actually done. The taste was not at all balanced - there was an unmistakable sourness that rendered it quite difficult to eat. Neither the mint or the fried onions in the topping could redeem it. Verdict: Definite thumbs down, unless you want to see what overly sour haleem tastes like. This is the second variant at Pakwaan Grand, and is very different from the Irani. This has big, bold flavours, and is not as finely smashed. As a result you have chunks of tender mutton as well as a few bones in it. The garnish of fresh mint cuts a bit through the thick taste of the masala, and a squeeze of lime is definitely recommended. Verdict: A good mutton haleem, but nothing outstanding. Pakwaan Grand is one of the restaurants pucca Hyderabadis swear by, and their haleem comes in two variants. The Irani was very finely smashed and subtly spiced. 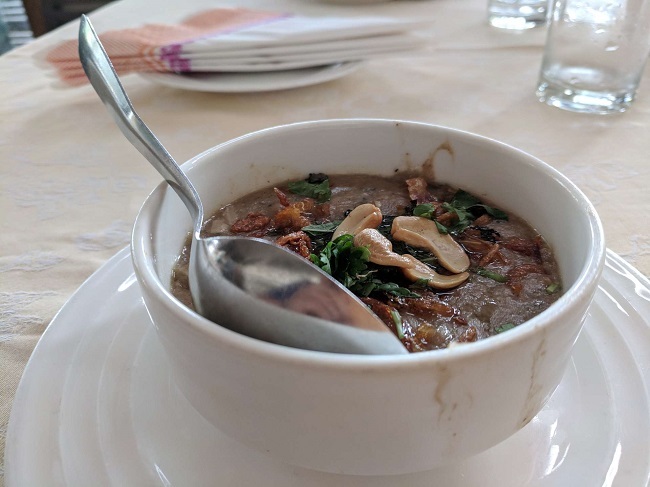 The garnish included a layer of cream and chopped almonds - these added a layer of taste to the haleem that absolutely elevated it. Definitely one of the finest haleems I’ve had. Verdict: Definitely one of the finest I’ve had this season - a must have. A heavy, beefy haleem (pun intended! ), very finely made. The mild spicing makes this easy to eat, though finishing it is another question altogether. The beef is unmistakable, and makes it really heavy. Best to split with at least two other friends, and then have a paan to help digest it! Verdict: The heaviest beef haleem I’ve had. Have only if you want to fill up. KBN is another old Hafeezpet restaurant. They make chicken haleem, which is a much lighter than the red meat haleems. This one had a slightly sour taste, and the fresh mint and coriander in the garnish are an integral part of the taste. To be noted is the presence of the ‘soup’ - this is tasty, but oily, and in this case needed a bit of toning down with some lime. Verdict: A perfectly serviceable chicken haleem, but not unmissable. Hafeezpet is a hub for beef haleem, and Bismillah hotel is one of the old time restaurants here. You can see the haleem being made right out in front of the restaurant from early in the morning. All that pounding results in a finely mashed haleem. The meat is really good and tender. The lightly spiced haleem is perfect with a squeeze of lime. Not rich, but a hearty meal in itself. The green coriander garnish brings a burst of freshness to the table. Verdict: If you want to have fine beef haleem, this is it. Paradise is the most branded and famous of Hyderabad’s restaurants. So much so that fake foodies declare their foodiness by claiming they don’t like Paradise biryani. Paradise makes tasty food, and their biryani is definitely one of the must try biryanis in Hyderabad. It’s a bit of a no brainer when faced with the choice of having haleem delivered from Paradise. Solid tasty haleem - big taste, well balanced and delivered in a super-portion. Well mashed, but with small chunks of tender mutton left in. Quite rich, but not so rich that it becomes cloying. This combined with the large portion-size makes this a one-portion haleem. Verdict: Must Have - share it with a friend for more special happiness! Faasos is another delivery only service that is best known for the chai they will deliver to your house. Yes, you heard that right - they will deliver 4 cups of chai to your house. Their snacks and chaat are quite good, and we have ordered from them several times. So when they listed haleem, I was not going to pass up the chance. When the haleem arrived, I was struck by how the packaging looked exactly like the inner packaging of Behrouz. When I opened it and tucked in, it looked, smelled and tasted exactly like the Behrouz haleem. My suspicions were confirmed when I asked the Behrouz folks on the phone if they made the haleem for Faasos, and they said yes. Verdict: Must Have - a less expensive way to have the Behrouz haleem. 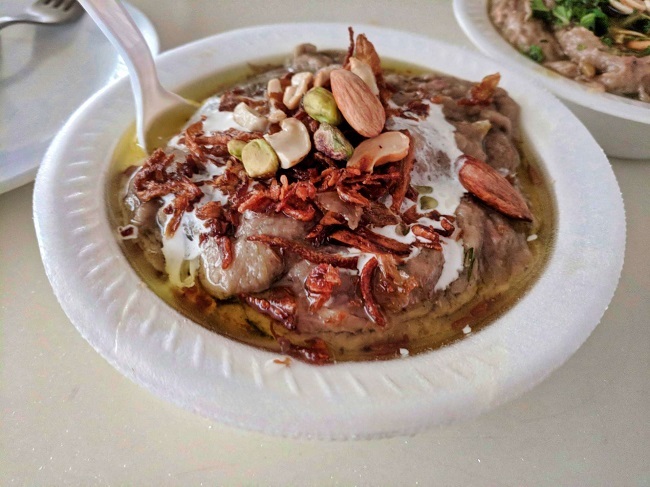 A delivery-only service that specializes in their own secret-recipe biryani, Behrouz is a new entrant in the haleem hustings. I am not a fan of their biryani - I think they try too hard to be very gourmet and miss the essence of a hearty biryani. So, ordering their haleem was mostly to tick it off the list. The haleem delivered in every sense. Here are my field notes, unedited! A thick, meaty haleem, perfectly mashed up, no spice, well balanced. So mild tasting that, if it were not for the fact that there are many more haleems to taste, you could comfortably eat a bucketful. A squeeze of lime takes it into gourmet territory. Easily the most finely made haleem I've had. The grand dame of Yousuf Tekri, Mandar has been around from the time it wasn’t fashionable to say you ate at Yousuf Tekri. It was where I ate one of my first few delicious Hyderabadi biryanis and experienced the hospitality of a typically Hyderabadi restaurant. The haleem, however, was a total let down. It was very coarse and heavy and the taste was really heavy handed. It was oily to a fault and even the mass of fried onions that topped it (something that can redeem most unimpressive dishes) failed to take me past the 40% mark in finishing it. This one fell below what I would even describe as a serviceable haleem. Surprising, given the Mandar pedigree. Verdict: Avoid. Have an extra portion at 4 Seasons or Shah Ghouse, both of which are spitting distance from Mandar. A new entrant into the biryani and haleem game, this was my first visit to the place. They have an entire array of Hyderabadi offerings, including a traditional breakfast I intend to try some day. Their slogan is “Big City Variety, Small Town Price,” and their menu certainly seems to reflect it. The haleem had higher grain content and more bones, was more fibrous and more oily. From a taste perspective, it was good generic haleem - quite delicious but cloyingly rich. Nothing stood out too much, but the extra husk gave it a very slight bitter after taste. 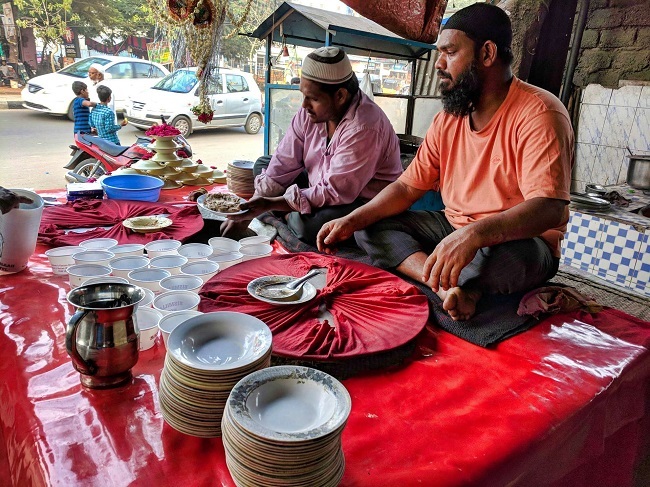 Another mainstay of the Hyderabadi biryani and food scene, Shah Ghouse is well-known for its army of servers all dressed in red uniforms serving you haleem in your car for half a kilometre on either side of the restaurant. 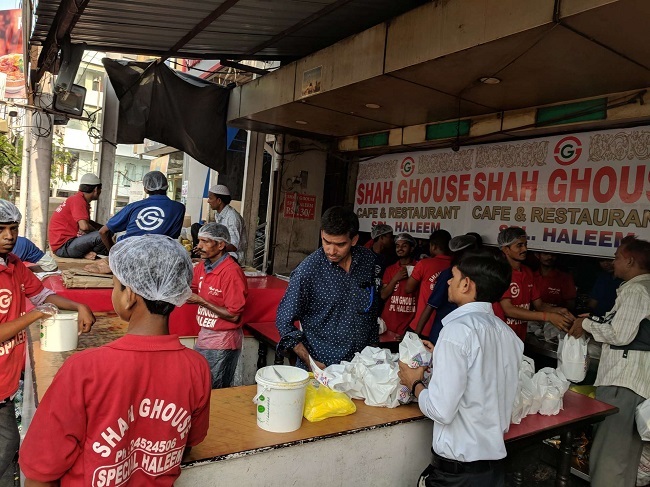 Shah Ghouse’s haleem operation is impressive as it all happens before your eyes. The massive cauldron in which it is made to the many different sized containers it is sold in are all arrayed before you when you walk in. The haleem was slightly rough, a bit fibrous and had a few bones. It was quite rich to taste, making eating more than one portion a challenge. The taste of whole black pepper and fresh mint made the dish really delicious. Overall, it was tastier than the 4 Seasons one, but the richness also meant you couldn’t eat a lot of it. 4 Seasons is one of the go-to restaurants for Hyderabadi food. My personal favourite there is the kabsa laham where the lamb is cooked so tender it falls off the bone. So naturally, when I heard they were serving haleem, I made a beeline for it. The haleem was very well balanced, mildly spicy and not overly rich. It was ground quite finely and the nuts were chopped quite small. Overall, it was a delicious, easy to eat haleem with its own unique taste. Disclaimer: This article was not paid for or commissioned by anyone associated with any of the businesses mentioned. Neither TNM nor any of its reviewers have any sort of business relationship with these businesses or anyone associated with them.